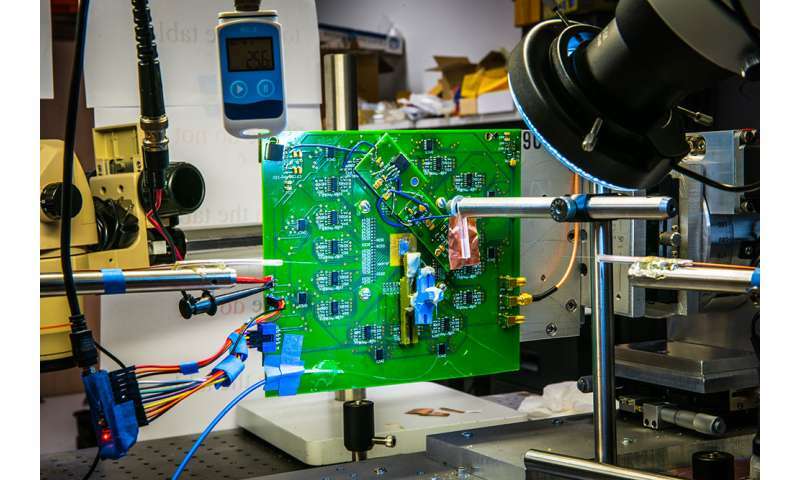 Last year, Hajimiri's team rolled out a one-dimensional version of the camera that was capable of detecting images in a line, such that it acted like a lensless barcode reader but with no mechanically moving parts. This year's advance was to build the first two-dimensional array capable of creating a full image. This first 2-D lensless camera has an array composed of just 64 light receivers in an 8 by 8 grid. The resulting image has low resolution. But this system represents a proof of concept for a fundamental rethinking of camera technology, Hajimiri and his colleagues say. The study is titled "An 8X8 Heterodyne Lens-less OPA Camera." This innovation should allow the creation of enormous telescopes at relatively little expense, especially useful when placed in orbit, as they will be light in weight and simple in structure. And when used as terrestrial scopes, active imaging to compensate for the atmosphere can be integrated into the phased array receiver. This will be revolutionary. @roger I agree completely. I am crying at how much I have spent on optics, it's up in the tens of thousands of US$. But this will revolutionize optical sensing, for every imaginable application. On the minus side, consider the use of this technology in surveillance. Paste one of these on every lamp post and every building facade.